Welcome to the Fit Small Business Xero training course! In this lesson, we’re going to cover how to create a bill in Xero. Why Is it Important to Create Bills in Xero? While most business owners prefer to keep track of the money that their customers owe them (known as accounts receivable) it is just as important to keep track of what you owe suppliers (known as accounts payable). Xero makes it easy to track all of your bills so that you can pay your suppliers on time. You can record payments made via check, ACH or credit card. Batch payments is also available if you need to pay a supplier multiple bills at once. We will discuss how batch payments work in the next lesson. You can set up payment terms so that Xero will generate a reminder once a bill is coming due. When you create the bill, you can assign the account that you want to track the expense to so that Xero can do the accounting for you in the background. Your accounts payable balance is always up-to-date. In this lesson, we walk through the steps to create a bill, how to modify a bill that was previously entered, and how to create a repeating bill for those items that you pay on a periodic basis (i.e. monthly, quarterly). We will also show you how the new side by side files feature which can help you enter bills faster and manage them more effectively. How Do I Create a Bill? 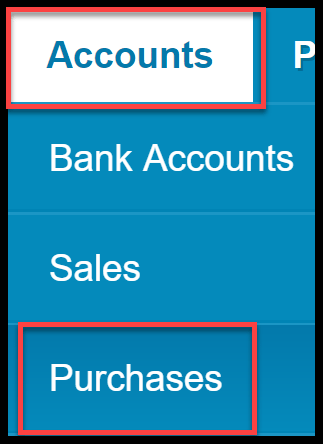 Step 1 – From the Accounts menu, select Purchases as indicated in the screenshot below. 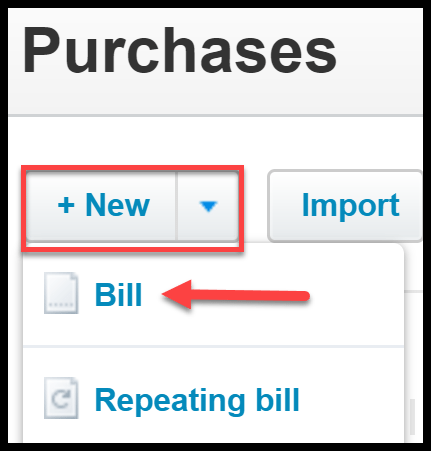 Step 2 – Click on the “New” button and select Bill as indicated in the screenshot below. Step 3 – The fields that need to be completed are indicated below, along with a brief explanation. From – Select the supplier from the dropdown. If you have not set up the supplier in Xero, just select +New Contact from the dropdown. In the how to set up suppliers lesson, we walk you through this step by step. 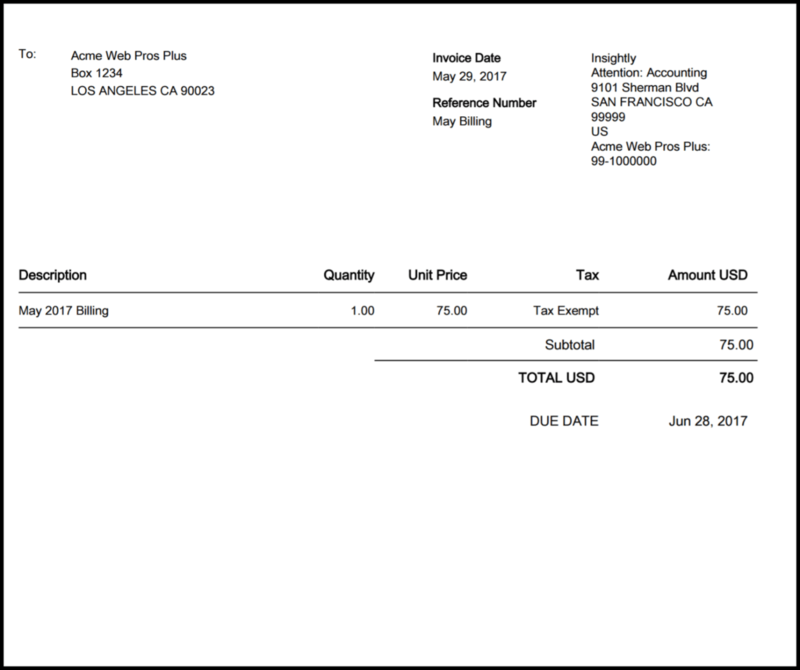 Date – Enter the Invoice (Bill Date) that appears on the bill received from the supplier. Due Date – If you set up default payment terms, this field will automatically populate. However, if you did not, you can enter the due date that appears on the bill in this field. Be sure to check out How to Customize Invoices to learn how to set up default payment terms for suppliers. Reference – This field is optional. You can include any additional info that you would like to keep track of in this field. Attach file – You can attach any supporting documents and a copy of the bill to this transaction in Xero. Just scan the document to your computer and click this button to attach it. Item – If you have been billed for core items that you purchase, you can select them from the dropdown in this field. However, if you did not previously set the item up you can do so by selecting “+New Item” from the dropdown. Description – This field will auto populate based on the item you selected. If you did not select an item, then type the description that appears on the supplier bill. Qty – Enter the quantity of items purchased. Note: For services, enter “1” in this field as indicated in the above screenshot. Unit Price – This field will auto-populate based on the item that you selected. If you did not select an item, enter the unit price that appears on the supplier bill. Account – Select the account that you want to categorize this purchase to from the dropdown. To learn more about accounts, check out the How to Set Up a Chart of Accounts tutorial. Region – You can turn on tracking categories to track other areas of your business like location, department or region. Select the appropriate category from the dropdown. Tax – This field will automatically populate based on the item that was selected; however, you can select a different tax rate from the dropdown if you need to. Check out the sales tax rates lesson to learn more. Amount – Xero will automatically multiply the quantity times the rate to calculate the amount. Note: If you need to pay a supplier in another currency, check out how to set up multi currency tutorial to learn how to pay bills in a foreign currency. 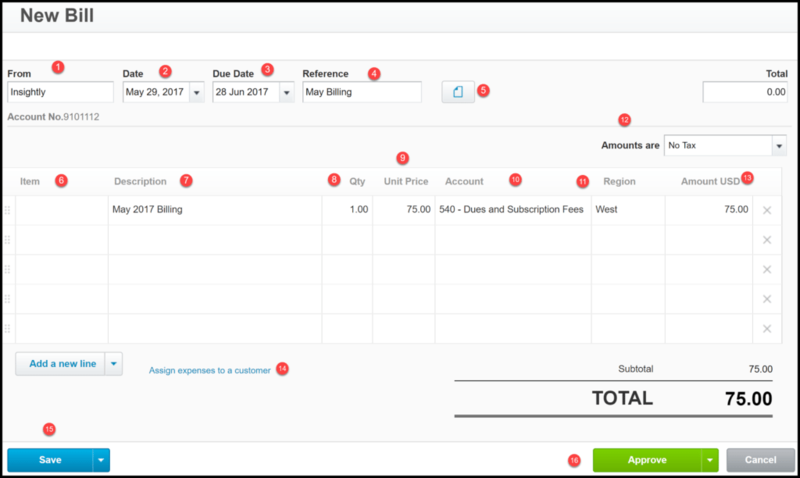 Assign expenses to a customer – If the purchase was made on behalf of a customer, you can select the customer here so that Xero can remind you to bill the customer back the next time you invoice that customer. Save – You can either save the bill or approve it. Below is a brief description of the various save options. Save as draft – This option will save the bill and allow you to close out of this screen. 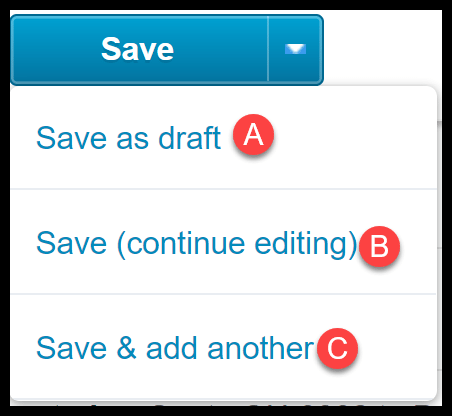 Save (continue editing) – This option will allow you to save the bill periodically so that you don’t lose any information if you need to come back and complete it later on. Save & add another – This option will save the bill as a draft and open up a new blank bill for you to complete. Step 4 – Below is a screenshot along with the various approve options you can choose from. Approve – This option will save your bill, and you can proceed to pay it via check or online with your bank or financial institution. Approve & add another – This option will save the bill as approved and it will open a new bill screen for you to create another bill. This feature allows you to enter a stack of bills very quickly because you don’t have to close out of the screen to create the next one. To save even more time, check out How to Import Bills tutorial to learn how to import bills from an Excel or csv file into Xero. 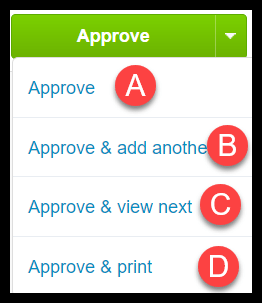 Approve & view next – This option allows you to approve the bill and then view any bills that may be awaiting your approval. In the How to Invite Users to Xero, we discuss how to give users permission to approve bills. Approve & print – This option will approve the bill and allow you to print it out. Step 1 – Return to Bills by selecting Accounts and Purchases as indicated below. Step 2 – A screenshot of the Bills dashboard along with a brief description of each section is provided below. Draft – These are bills that you have created but you have not approved them or submitted them for approval. Note: Bills in a draft status have no impact on your financial statements. Awaiting Approval – Bills that have been submitted for approval, but have not been approved yet. Note: Bills in this group do not affect the financial statements. Awaiting Payment – Bills in this group have been entered into Xero but not paid. Note: Bills in this group do affect the financial statements. Overdue – These are bills that were not paid as of their due date. In the How to Create an Accounts Payable Aging Report, we will share some tips on how to stay on top of your accounts payable balances. Due/Paid – Based on the legend In the screenshot above, the blue bar represents invoices that are due and the green bar represents invoices that were paid. Dates – Scroll to the right or left to see the total amount of bills coming due and bills that you have paid. Step 3 – Click on the category (draft, awaiting approval, awaiting payment, overdue) that includes the bill you would like to make changes to. The following screen will display. Click anywhere in the row of the bill that you want to select. Step 4 – The bill should display on the screen as indicated below. You can make any changes that you need to and save/approve them once you are done. Note: You cannot make any changes to a bill that has been partially or fully paid. If you need to make edits to a bill that was previously paid, you would have to remove the payments first, edit the bill and then re-apply the payment. As we mentioned previously, you can set up recurring bills that you pay on a periodic basis such as monthly, weekly or quarterly. You can also delete and copy bills. First we will cover how to set up a repeating bill and then we will show you how to delete and copy bills. Step 1 – Follow the steps in the previous section to display the bill. Step 2 – Select the “Bill Options” button as indicated in the screenshot below. 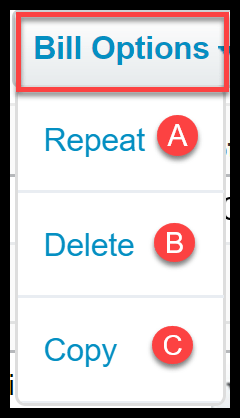 Navigate to Repeat, Delete or Copy a Bill in Xero. A. Repeating Bill – Below is a screenshot along with the info that you need to provide to set up a repeating bill. Create a Repeating Bill in Xero. 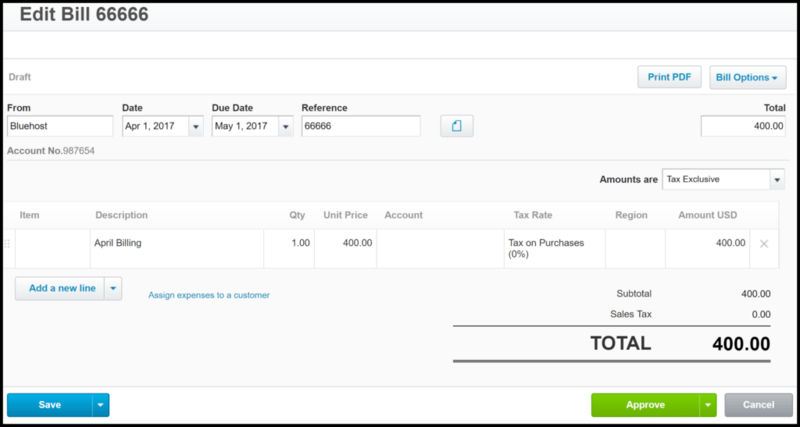 Repeat transaction every – From the dropdown, select month(s) or week(s) and indicate a number in the box to the left of this field. Bill Date – Indicate the date of the first bill that will be created and then Xero will increment the bill dates for all future bills created. 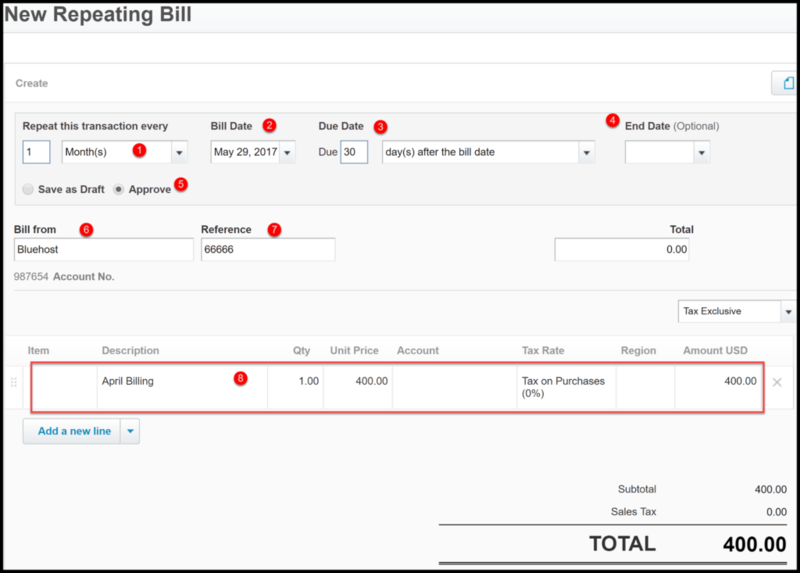 Due Date – Indicate the due date for the bill; otherwise this field will autopopulate with the default due dates that were set up in the How to Customize Invoices Lesson. End Date – This field is optional. You can indicate when you would like Xero to stop creating repeating bills. Note: You can cancel repeating bills anytime. Save as draft/Approve – Indicate whether you want the repeating bills to save as draft or automatically approve once they are created. Note: The options here will depend on the user permissions you have been set up with. Bill From – This field should include your supplier’s name. Reference – This field is optional. Note: Whatever you put in this field will appear on every repeating bill that is created. Description/Qty/Unit Price/Account/Tax Rate – Be sure to include the info that should be used to create all future repeating bills. Once you have saved the repeating bill, you will see a new tab that says “Repeating” and the details of all bills that you have set up as repeating will appear as indicated in the screenshot below. B. Delete a Bill – In general, you should not get in the habit of deleting information from your accounting software program. However, there are times when it is ok to do so. You can delete a bill that has not been paid.Display the bill as shown in the How to Modify Bills section and select delete from the bill options indicated in the screenshot above. Note: If you are not able to delete the bill because it has been paid you will have to Void it instead. C. Copy Bill – If you receive bills from a supplier that are almost identical, you can copy a bill that was previously entered and just make the few changes necessary to save you a few keystrokes. Follow the steps outlined in the How to Modify Bills section to display the bill. Select copy from the Bills Options button as indicated in the screenshot above. Make any necessary changes to the bill and save it. One of the newest features that Xero offers is called side-by-side files. This cool feature allows you to store copies of your bills, invoices and other documents within Xero next to the transactions they relate to. This will allow you to easily access these documents during tax season, or in case of an audit. To use this feature, you can either email documents to your Xero Inbox or drag & drop documents directly into the inbox. From the Dashboard, click on the file icon as indicated in the screenshot below. Step 2 – Your Xero email address will display as indicated in the screenshot below. Provide this email address to suppliers, customers and anyone else who sends you documents that you would like to attach to transactions. Send Files to your Xero Email Address so that they appear in the Inbox within Xero. Note: You can also drag and drop documents saved to your computer or take a photo of a receipt and save it here. Step 3 – Select a file to create a transaction. Select a document within your Xero inbox by putting a checkmark next to it and then click on the “Add to new” button to create a transaction as indicated in the screenshot below. Create a new transaction from a file uploaded to your Xero Inbox. Step 4 – In the next screen, you will see a side-by-side view of the bill that was uploaded (on the left) and the new bill screen (on the right). Using the side-by-side view, enter the details of a bill (located on the left) into the new bill window in Xero (on the right). This side-by-side view allows you to easily enter the details of a bill, customer invoice, expense claim or receive/spend money transaction since the details are right in front of you. Best of all, the document is automatically attached to the transaction so you can access it whenever you need to. That wraps up the section on how to create a bill. The next lesson in our Xero Training Course will be how to pay bills. In this lesson, we will walk you through how to pay bills that were previously entered into Xero. To access this lesson or any of the others in the series, click here. For a free 30-day trial of Xero, click the link below.